Malanka (Ukrainian New Year’s Eve) is traditionally celebrated on January 13th. It is rich in ancient ritual, folklore and magic. The ancestors of Ukrainians believed that on New Year’s Eve, good and evil spirits descended on the earth. In order to ward off the evil forces and ensure a bountiful new year, the night was spent in dancing, partaking of a lavish and ritualistic meal, fortune telling, courting, casting of spells and singing carols of well wishes called Shchedrivky. We may not believe in the old myths, or carry on ancient traditions, but what better way to bring in a new year than to celebrate with excellent food, exceptional entertainment in the company of close friends and legendary Ukrainian hospitality. We look forward to see you at our next Malanka on Saturday, January 25, 2020. 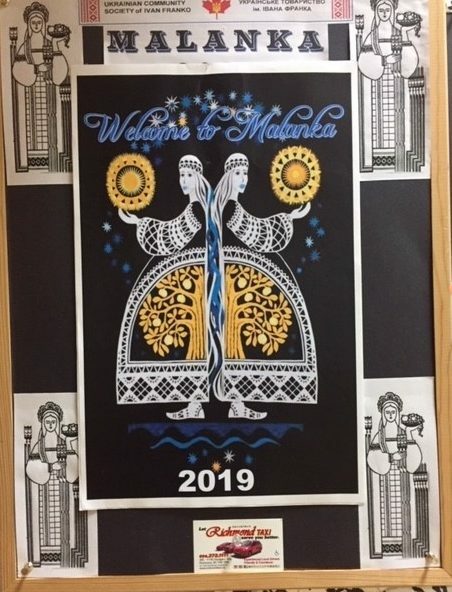 There was anticipation and excitement on Saturday, January 26th, 2019 at our Ivan Franko Community Centre as people gathered for another sold out Malanka. While enjoying a delicious variety of hors d’oeuvres, our guests were entertained by the Ukrainian Prairie Band playing old-time Ukrainian music on tsymbaly, fiddle, accordian, and guitar under the leadership of Gladys Andreas. 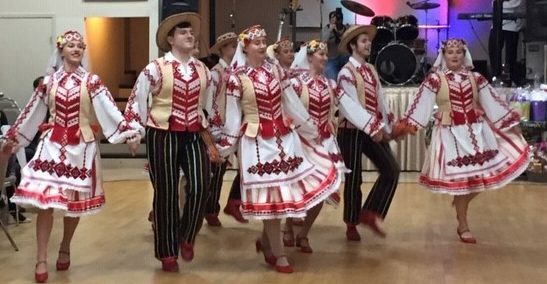 This was followed by a sumptuous buffet dinner including pyrohy, holubtsi, kasha, sauerkraut, salmon, roast beef, a variety of salads and other items that would give everyone the energy to dance the night away. 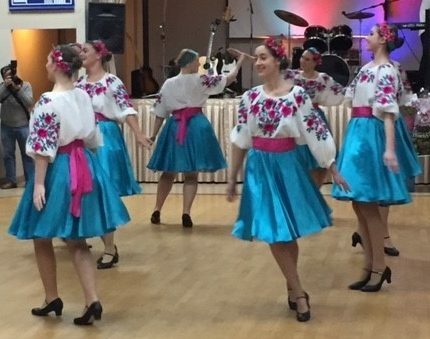 After dinner, Tamara Pitts introduced our program of a selection of Ukrainian dances performed by Dovbush Ukrainian Dancers of Vancouver and Kvitka Ukrainian Dancers from Surrey. Their energized performances were very well received by our guests. Also, back by popular demand, S-Bahn played past midnight. The musicians were vocalist Richard Tyce on accordian and keyboards, Fred Ardiel on guitar, James Bartz on drums and vocalist Kurt Ward – Tyce playing the violin and mandolin. Everyone also thoroughly enjoyed listening to a great selection of Alpenhorn music performed by Jim Hopson. The dance floor was full as S-Bahn played and sang a wide selection of songs including the traditional and highly entertaining kolomayka. As midnight approached, we were handed sparkling wine, noisemakers and hats and the New Year was celebrated by all. The MC duties were ably handled by Theresa Herchak and by George Brandak, our President. Many thanks to our Malanka Committee for its organization and preparation for this year’s festivities. Fran Zukewich, our Volunteer Director, ensured we had volunteers to help with the food preparation, setup, decorating, ticket sales and various other tasks and staff that prepared and served an outstanding meal. Malanka would not be possible without the hard work and efforts of many. We are also very grateful to Dixon Mitchell Investment Counsel for their generous donation and sponsorship of Malanka 2019. With its financial support, we are providing our guests with a fabulous evening of entertainment. Thanks so much Dixon Mitchell for your support! We look forward to seeing you next year on Saturday, January 25, 2020. So much more to see and do! Along with our traditional Friday Night Family Suppers, and Saturday Food Sales, we've had special events, visiting dancers, choirs, authors. There are a variety of seasonal activities, from Summer plant sales, to Christmas Craft Fairs. Join us to share in the fun. Sharing in all good things Ukrainian has had volunteers visiting other festivals as well. At the Scandinavian Festival in 2009, we put on display a variety of cultural fare showing off our food, art, music, literature and of course, colourful pysanka! If you have nimble fingers or know of someone who does, we need you on Tuesday morning for perogy pinching! We could also use your help to roll cabbage rolls on Thursday morning. We can offer great company and great conversation. You don't have to be Ukrainian to join our team! Find out how volunteering benefits everyone by contacting Fran at The Ukrainian Centre. Kontakt is broadcasting in BC. Programming can be found on OMNI 1 (Ch. 8 on Shaw) every Sunday at 8am, Mondays at noon, and Thursdays at 3 pm. Ukrainian Roots Radio — Vancouver & Nanaimo.